For the past few years, much of the conversation within the design community has been how to survive the economic downturn. Designers, architects, contractors, showrooms, design centers, vendors and suppliers have all experienced this downturn in one way or another. In recent months however, conversations have been more positive. The reason? The economy appears to be growing, new housing stats are increasing, and buyers are gobbling up properties. As business and manufacturing sectors expand, so will the need for design professionals. And according to Remodeling Magazine, consumers who have long delayed even the most essential of projects are contemplating what needs to be done. As we all look forward to better times, and with 10,000 Baby Boomers turning 65 every day, the conversation is most timely about how to adapt, design, and plan our home and workplace environments, and even cities and towns, to accommodate the impact 76 million Boomers will have over time. And while those aging-in-place concepts are still valid, it is time to expand the conversation. To the point, many who embraced age-in-place concepts, including myself, thought too small. It isn’t about the design of spaces to accommodate an aging population. What it is about, is the thoughtful design of spaces and communities that support the quality of life -- no matter the years or mobility. This is an example of a DAASE member who incorporated both aging in place + universal design and merged them with green sustainable design elements. 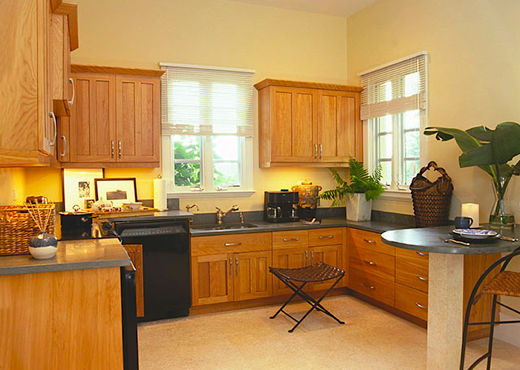 The kitchen features multiple counter heights with quartz counters and woods from a certified sustainable forest. But the conversations need not stop with aging in place. It is also time for a fresh conversation about sustainability. When we think “green,” we refer to the design of environments that are both sensitive to the use of the planet's resources and energy efficient. However, lately green design has been much more about “brand marketing,” a trend in building design that is more than just an effort to reduce the impact on the environment. What about sustaining the quality of life? With those themes in mind, a small group of designers, contractors, business associates, realtors, healthcare professionals and industry partners began conversations that merged the elements of universal design and aging-in-place with sustainable design concepts. support advances in the design of both homes and communities. This new group is called the Design Alliance for Accessible Sustainable Environments (DAASE). We call it “Daisy” for short. It is now a registered 501(c)3 non-profit organization with a rapidly growing number of members from Florida to California. Membership categories include interior designers, architects, contractors, real estate, financial and healthcare professionals as well as consumers and other nonprofit groups. The mission of DAASE is to inform, educate and advocate that which supports the quality of life and to be an acknowledged resource for consumers while providing thoughtful leadership thru, by and for members. In a few short months, DAASE has developed a robust website, a Facebook page, Linked-In special interest page, created member marketing tools, published an exclusive home assessment guide and provided lectures and educational workshops. It is about an opportunity to change the course of conversation within our communities to inspire action by our civic leaders that encourages regulations that address both environmental design and the design of environments. With “design” as a common denominator and developing partnerships with others, the conversation in our community can and will evolve to sustaining the quality of life for all people, no matter their location, economic status, age, agility or ability. As one of the leaders of this new group, I am excited about the potential it has to deliver such an important message to consumers and to be able to create a platform to bring together diverse groups of business and design associates. For more information about DAASE, visit the website or "like" them on Facebook.